Any homestead with a pond will typically attract various types of birds and even ducks. You may have an interest in keeping a few ducks, but do not have any area of water available. Water is something which is essential for a backyard duck habitat. If you do not have a pond, then a DIY option is available to make a suitable area for ducks. You should first determine where you want to have a backyard duck habitat located. This could depend on the perimeter of your property and being able to easily change the water. Ducks prefer to have water that is fresh and means you need to have a way to empty and refill your backyard duck habitat. All the materials needed to build a backyard duck habitat can be found at any home improvement store in your area. You can also use scrap material or reclaimed material for this project. The most important aspect of this project is the container for the water. A plastic tub is a great option, but you can also use any old in-ground plastic pond. Your backyard duck habitat will need to have a suitable frame. This is something you can build from a few old pallets or you can buy new pieces of lumber. 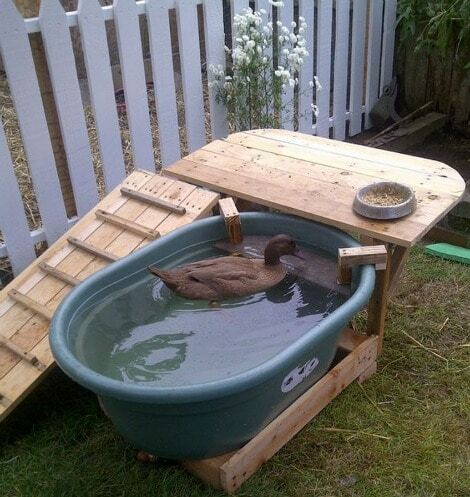 The idea is to make a platform for the ducks to use to get in and out of the tub. The best thing about a DIY woodworking project is you can easily make any changes or modifications to improve upon the result that you expect. A few parts will be needed to get your backyard duck habitat working. You will need to include a drain for removing old water from the tub. The drain needs to open and close manually. There are many ways to do this based on the solution you want to use.